In most Central American countries, the rainy season occurs from July through September, give or take a month or two depending on the region. Will it rain? Absolutely—sometimes, torrentially. Will it get in the way of activities? Sometimes. Will it ruin my vacation? Absolutely not. If you're considering traveling during Central America's rainy season, here are a few things to keep in mind. Central American travel is cheaper during the rainy season. Also, that means far fewer tourists, which can be fantastic when taking in Central America's sights. Keep an eye out for rainy season discounts, including airfare and hotels. Even during the height of Central America's rainy season, it rarely rains all day. Different regions vary, but typically, the storms tend to roll in during the afternoon and evening, often raining into the night. Plan outdoor activities during the sunny mornings. Don't make the mistake of heading somewhere remote before a storm, because you might get stuck. For example, if you're somewhere isolated, swollen streams can cover the roads back to civilization. You may have to wait in the storm until rains let up. When the afternoon rain comes, take advantage of this downtime by taking a siesta, reading, getting a spa treatment, or relaxing in general. After all, you're on vacation and need time to recharge. Expect rain, so pack wisely. Depending on where you are, rains can be warm or cool. You'll want a windbreaker and shoes that can handle rain and mud. Bring several fold-away plastic ponchos to wrap around yourself and your backpack, because you never know when you'll need to walk a few blocks in the rain. Other items to bring include a book to read when it's raining, plastic bags for electronics, mosquito repellant and net, a waterproof flashlight, and batteries. In Central America, the rainy season is also known as the "green season," because the landscape is far, far lusher than in dryer months. You'll see the jungle and canopies in full bloom this time of year. Rainy season is one thing, but hurricane season is another. If you're traveling in Central America's hurricane-prone region, such as the Caribbean coasts of Belize and Honduras, pay attention to the news and heed any storm warnings. You can't control the weather, so you'll need to stay flexible. Always have a backup activity to get the most out of your time here. To avoid flight delays, schedule arrivals and departures for the morning or late evening. Other transportation issues to anticipate are flooded roads and ferry or bus delays or even cancellations. If you're especially concerned about rain affecting your trip, consider purchasing trip insurance before you go. Actually, trip insurance is a good idea whenever traveling internationally. Make sure the insurance covers both medical emergencies and any electronics in case they get wet. Mosquitos are always a concern in Central America. These pesky bugs can spread dengue fever, yellow fever, and Zika. Bring DEET spray, mosquito repellent bracelets, and long-sleeve shirts and pants to cover your skin. Also be sure to get vaccinations before you leave and carry proof to show officials when entering countries. 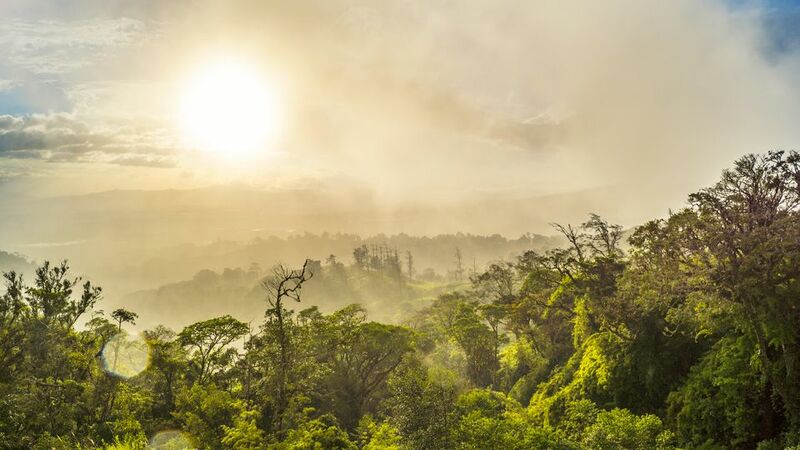 Wet season or dry season, rain or shine, travel in Central America is incredible. Don't let the rain dampen your adventures.